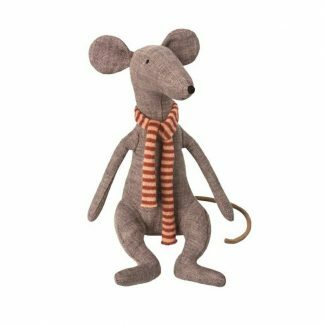 Come and meet Maileg’s Cool Rats. Put simply, they’re rats and we think they’re cool. They are made from linen and come in a choice of grey and blue. Both have lovely long rat tails and stripy scarves. Each rat has it’s own card box to live in (which is probably for the best). Watch as your little ones bring these rodents to life! Don’t forget to add gift wrap for that extra special touch.